So, I meant to get a little trim from my favorite stylist before leaving the OC, but between the packing and the whatnot, I sort of forgot all about my hair. Which meant that it was much longer than usual by the time I arrived in DC, and only grew more unwieldy the longer I postponed getting a haircut here. 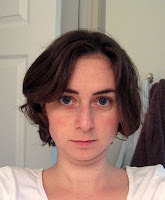 C) My hair is curly when cut short, which seems to confound a lot of stylists. So really B and C are only window dressing, and could be dealt with if my major issue wasn't A. In the last couple of weeks I had asked some locals for recommendations, but apparently they aren't quite as Jewish frugal as I am, and thus pay something like $50 or $60 per haircut. As I am both Jewish thrifty and unemployed, I rather unwisely decided that this was out of the question. So I dithered and avoided any action, until The Pit pointedly asked me if I was planning on getting a haircut this week. This from a man who really doesn't seem to care what I do with my hair, as long as I keep it unclipped* at all costs. If even he had noticed the deplorable state of my coiffure, it really was time for a haircut. I thus bit the bullet and located a $20/haircut salon near our grocery store, and decided that with pictorial assistance, the stylists there could potentially be trusted. Hopefully it grows out soon, and then I can go squander more money on a real stylist. Local suggestions would be appreciated in the comments. I promise this time I'll listen. * The Pit has an unnatural aversion to hair clips anywhere near me, which makes this whole bad haircut styling thing even more difficult. ** So we know this haircut is possible...it's not like I told her "I want Jennifer Aniston hair." haha. i go to the paul mitchell school salon for my $16 hair cuts and usually end up recutting the "long side" when I get home. 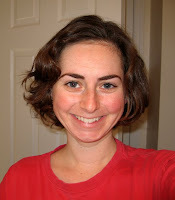 at my last appt, I seriously thought the stylist had some problems with contralateral neglect b/c she spent 90% of her time cutting one side of my hair. ah, to be "thrifty". Heh, nice to know I'm not alone with my long side. I'm going to get my mom to even out the front when I go home to visit.